‘Good design happens when you are happy’ – with this simple but uplifting message Es Devlin, designer of the Olympic Closing Ceremony and creative director for numerous high profile pop music artists such as Kanye West and the Pet Shop Boys closed a fascinating event at the V&A. From this single day’s presentations and discussions, it is clear that there is a lot of happy people around in this field of design, because the range and quality of work on show was astounding. Though we didn’t get to see any of Es’ work, the high profile projects by Misty Buckley and Willie Williams were complemented by exciting, though less well-known work by designers from the UK, Austria, Ireland, Mexico, Japan and Prague. The event was part of the on-going 3-year project on scenography organised by the Prague Quadrennial. SharedSpace: Music Weather Politics (http://www.pq.cz/en/sharedspace.html) is an ambitious international series of interdisciplinary research and communication events, art projects, and performances running until 2016. Its focus is the design of space, place and artefacts for performance but its influence extends beyond artistic creativity to politics and society. The work processes for these projects are often very different from other fields in the design and construction industry, and the presenters here had masses of hands-on experience to share. Buckley described the three week intensive design and construction phase living on site at Glastonbury Festival where she is creative director, and the two exciting moments that book-end the event – when the 180,000 crowd first stream onto the site at the start, and when Michael Eavis’ cows return to the field after every stick and tent and bottle cap has been removed at the end. Her work process for the 2012 Paralympics closing ceremony was remarkably similar with an on-site workshop delivering the multitude of mobile effects, vehicles and costumes. 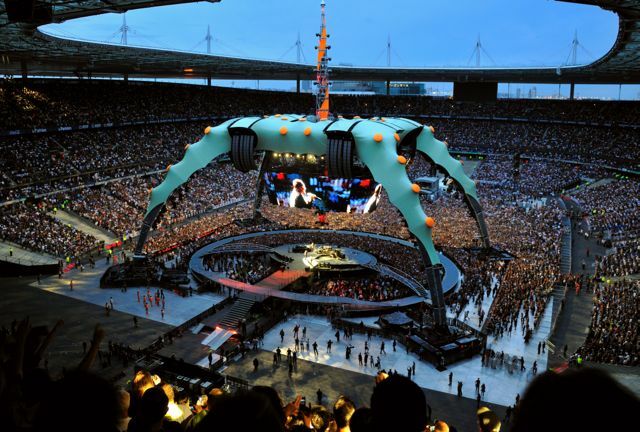 Williams’ presentation on the U2 360 degree stage set was a tour-de-force, as exciting for the many students and aspiring designers present as a gig by the band. Surely the zenith of pop music mobile or fixed shows, he had no time here for technical descriptions describing how the stage is deployed, but talked instead about how the audience experience drove the concept. Getting more people closer to the show, and allowing the audience themselves to be the backdrop for the band’s performance created a greater intimacy (in shows of up to 100,000 people!) and increased engagement between all the people who set out on the day of each concert to be together in one place to experience together their favourite band. His most surprising image was of a flash mob event at a Polish gig in which the entire audience displayed white and red clothing to create a stadium sized national flag. Indeed, if there was a theme running through the day, it was how all the designers strived for audience engagement as the crucial indication that their creations ‘worked’. From community festivals in Mexico (Monica Raya) to Shakespearian productions in Cork’s city park (Roma Patel), putting the audience experience first, not only as voyeurs but also as active participants is a key prerequisite for contemporary scenographers. Susanna Boehm’s twenty minute guide on how to design a $7million stage opera set on an island in Lake Constance for the Bregenz Festival was impressive for its ‘nothing is impossible’ attitude, but also for the result – opening up a whole new audience to opera. She revealed that the festival’s second biggest annual earner is now the back-stage public tours, proving that people not only appreciate the craft of stage design as an experience but are also fascinated by how it is put into practice. There was, however, an empty chair at this feast of temporary and mobile performance architecture. Mark Fisher, whose fierce imagination has been involved in so many of the key advances in stagecraft for popular music performance and festival and stage events, died earlier this year. Ric Lupson of StuFish presented a short tribute film to the man and his work. Mark once said of his working life how in 1977 he had packed up and joined the circus. After a day of watching ideas like this, so many of them brought to fruition to leave vibrant positive memories with audiences and participants around the world, how could anyone not want to do the same thing.